Spineless, And Now Homeless: National Zoo Closes Animal Exhibit : The Two-Way Invertebrates make up about 99 percent of all species. But they're no longer being featured at the National Zoo after the exhibit was shuttered due to budget issues. 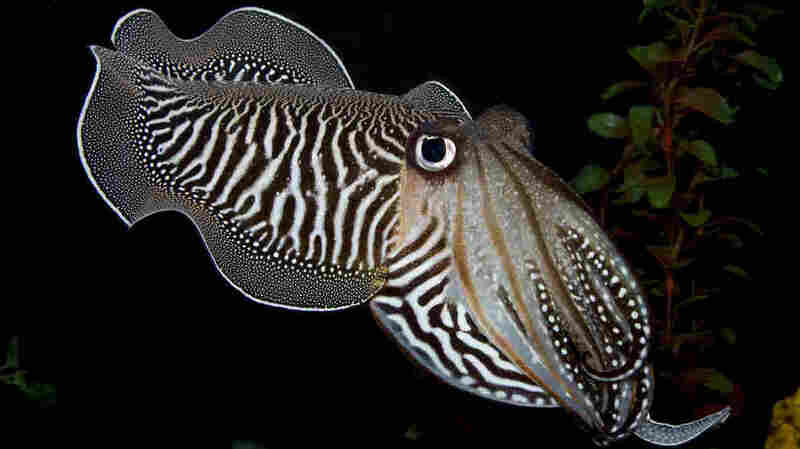 A cuttlefish gazes at a camera in the Smithsonian's National Zoo Invertebrate Exhibit. The exhibit, home to dozens of small aquatic and terrestrial species without backbones, closed Sunday. Invertebrates make up about 99 percent of all species. But they're no longer being featured at the National Zoo due to budget problems. The Invertebrate Exhibit was shut down Sunday, less than a week after the closure was publicly announced. The zoo says its exhibit of cuttlefish, butterflies, spiders and other spineless animals, which first opened in 1987, needs $5 million in upgrades, along with $1 million annually. But officials say their fundraising priorities lie elsewhere, including a renovation of the zoo's Bird House. The exhibit of spineless animals "is not included in the zoo's five-year strategic plan or its 20-year master plan," The Associated Press said Monday. "Plans call for a future Hall of Biodiversity, including invertebrates." "Having the nation's zoo suddenly and with little public warning close a long-standing exhibit is unprecedented. Public comments on the Museum's Facebook page are overwhelmingly shocked and negative, including some from volunteers that work at the Zoo." On the zoo's Facebook page, the suspicion has been raised that zoo Director Dennis Kelly purposefully avoided disclosing his plan until the final week as a way to avoid a public campaign to save the exhibit. Others simply aired their regret about the closing. "This is such a terrible loss," one recent comment reads. "I understand that many visitors prefer the 'charismatic megafauna' but the invertebrate exhibit was such a great learning experience. It served to really help kids understand what biological diversity is all about." On Thursday, Kelly responded to concerns about the zoo's shutdown of the exhibit — and about what will become of all the spineless animals once it's dismantled. "We are committed to finding the best possible homes for all the animals and will not euthanize healthy invertebrates," he said. "While unlikely, there may be individual specimens where quality-of-life or untreatable-disease concerns would lead to a recommendation for humane euthanasia." The wide world of invertebrates includes insects, crustaceans, worms, shellfish and spiders — and as NPR's Christopher Joyce reported 10 years ago, the animals have been a tough sell for conservation efforts. "Invertebrates are not furry," he said. "They don't eat out of your hand. They're parasites; they bite and sting. But their disappearance would fundamentally change the planet."